West Side Jewish Center – Congregation Beth Israel considered a combination temple/residential building, but thought better of it. 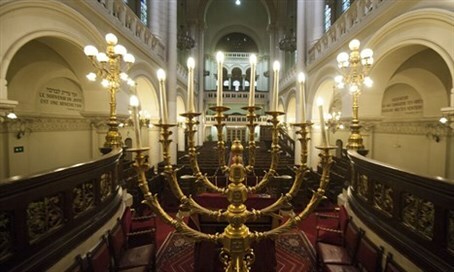 A New York City Orthodox synagogue, located just blocks from the Empire State Building, recently considered building a 19-story ‘SynaCondo’ – but eventually turned down the idea. The West Side Jewish Center – Congregation Beth Israel, founded in 1890, has been located at 347 West 34th Street since 1925. The neighborhood is undergoing massive changes, according to The Forward, and the shul has been working with architect Esther Sperber for more than a year on several proposals, one of which was a huge combined temple/residential project. Curbed, a New York real estate website, reported Saturday that the so-called SynaCondo idea is still on the table and would involve a demolition of the 90-year-old shul. But both the spiritual leader and president of Congregation Beth Israel told The Forward that plan has been rejected. “Our membership quite overwhelmingly rejected any plans for demolition of our current synagogue building and any plan we might pursue will preserve our existing synagogue structure,” said Rabbi Jason Herman. Sperber and Congregation President Brett Firfer told The Forward that the congregation will most likely keep the existing historic building, bring it up to code, and develop the adjacent parking lot it owns. The proposed Hudson Yards Redevelopment Project will include new residential and office towers, schools, a park and a mall, bringing thousands of new residents to the synagogue's vicinity. A block away, the Farley Post Office building is being converted into a new Penn Station, and south of the Jacob Javits Convention Center, an entire new neighborhood is planned near the new subway station that extended the 7 Line to 11th Avenue. “I was very interested in studying the possibility of a mixed-use building since this is applicable to many religious institutions in the city," Sperber explained. "We therefore developed this scheme which we have shared with the congregation." “The community seems to love this building and would like to preserve it, if that’s possible, realizing it’s not an easy building to renovate and make into a 21st Century synagogue that would serve them into the next century,” she added.